Lakeshore Baptist Church began in 1911 in the home of R. C. Crysell. 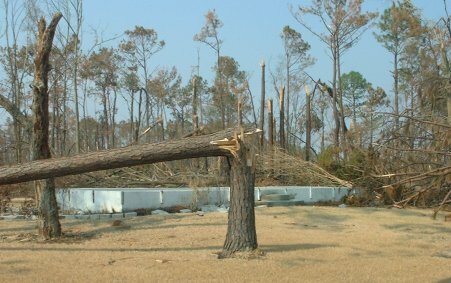 Shortly after erecting a church building a hurricane pounded our community leaving the structure in ruins. Ninety years later we find ourselves in a similar situation. Like then, the generosity of fellow believers came to our assistance to rebuild and move forward to the glory of God. The following article appeared in the Alabama Baptist paper in November of 1915. Many will regret to hear that our mission church at Lakeshore was destroyed by the recent storm upon the coast. Its history reads like a novel. It was organized by only a few members, under the leadership of Rev. Buchanan, who, no doubt, was killed, as he mysteriously disappeared. They were greatly opposed and persecuted by the Roman Catholics. After Mr. Buchanan’s death, the little band was like sheep without a shepherd until Brother McCardle and another minister started the work again and succeeded in securing several members among whom was a Roman Catholic who was baptized, regardless of the many threats made. Then again for several months they had no pastor, yet kept busy erecting them a house of worship. Our State Board came to their rescue by sending the writer to them as pastor and assisting them some upon their house of worship. We found only thirteen members, many of whom were children waiting our arrival. God alone knows our struggles yet within six months after arriving, our number had grown above thirty members, several being heads of Roman Catholic families. Owing to the combined opposition of the Roman Catholic priests and a Methodist minister who was recently killed by a train enroute there, the work has had but little growth since, save they have been holding the fort for God’s glory. Brother and Sister R. C. Crysell, who have done so much for the church, paid the balance of debt upon the building just before the storm. This they did by great sacrifice. Some of God’s most faithful on earth are among its members. Many of these have come into the Baptist church under great persecution. They occupy one of the greatest missionary fields on earth, being the only Baptist church on the L. & N. railroad east of New Orleans, for a distance of fifty miles, surrounded by Catholicism and the godless atmosphere of the coast. No place is in greater need, yet today their building lies flat upon the ground with their organ and seats broken, yet criticized no doubt by their godless and merciless persecutors. Shall the Baptists of Mississippi see the good work they have so gloriously begun now stop and progress be hindered forever, or will they go at once to their rescue? No doubt God put it into the heart of our editor to make that noble appeal for Roman Catholic territory which he made just before the storm. Here is your opportunity! The land is before you. Will you possess it? To delay is half to fall! Although we are in another state, we desire to join God’s faithful in Mississippi who are upon the firing line to send a prayer meeting or Sunday School offering to those dear saints who are in so great need. However small the offering from each may be, if given by each church, we all shall share the victory even from the jaws of defeat. Brother pastors and superintendents, our people will gladly respond if given an opportunity. Will we do it for Jesus’ sake? God grant we shall! God bless you! If you followed my blog before the storm, you might recall a couple of controversial entries concerning “Johnny Hunt on Election” and a follow up entitled “Johnny Hunt, Election, and Mathew 18.” Through those discussions I met Nathan White, a member of Grace Bible Church near Atlanta. 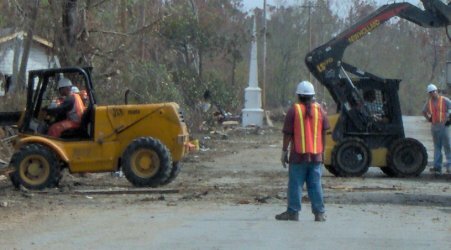 When his pastor, Dave Stephenson, expressed an interest in their church helping a sister church hit hard by Katrina, Nathan pointed them to us. Wasting no time, the church loaded a truck with much needed supplies and sent Greg London to Lakeshore. Greg has become my right hand in the recovery efforts. He has already made three trips and plans to be here again tomorrow morning with another team from Grace Bible Church. Nathan and Pastor Dave came down last week. Nathan posted to his blog before coming down and then again after his Trip to Lakeshore. His buddy Colin accompanied the team and you can also read Colin’s account. They have several pictures, so check out their sites. btw, Bro. Hodges found us via my long time online friend Richard Dickson, who serves as Interim Associate Pastor for Sisters Baptist Church. I know Richard through the SBC-D discussion group. Hurricane Katrina hit Lakeshore Baptist Church hard. She took our church buildings and almost all of our church member’s homes. Even with such a devastating blow, we know that Christ proves himself stronger than any storm. The body of Christ has come to our aid in overwhelming ways. We especially thank God for the Sisters Baptist Church. Your financial assistance lightened our financial burden and enabled us to continue ministering in the greatest time of need. We praise God for Dan Hodges, Grady, and George who made the long trip down to meet us face to face and provide physical help even before most of our church family were able to return to the area. We believe your timely response and gifts magnified the Lord our Provider. Lakeshore Baptist Church extends our gratitude and thanks. Please remember us in prayer as we move forward to the glory of God. 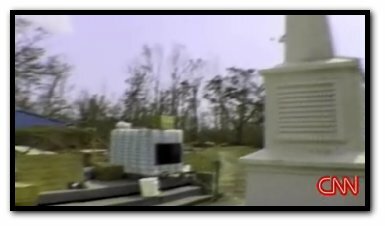 The Florida Baptist Witness did a story on the great folks from Sawgrass Fellowship coming to help Lakeshore Baptist Church in the wake of hurricane Katrina. SUNRISE (FBW)–A little bit can go a long way in a time of crisis according to Jan Deans, senior pastor at Sawgrass Fellowship in Sunrise. 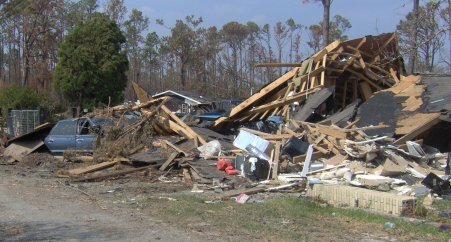 After Hurricane Katrina struck the Gulf Coast, the small church worked with their mother church, Coral Baptist in Coral Springs to send much-needed supplies to Lakeshore, Miss., 30 miles east of New Orleans. We deeply appreciate the help Jan, Steve, and the other folks from SF brought. We look forward to their return visit in November. btw, It looks like Sawgrass Fellowship just launched a new web site. Check it out. I talked to some folks day before yesterday who came down to Lakeshore for the first time since the storm. They could not believe the utter devastation, the number of downed trees, the piles of rubble strewn everywhere they looked. The scene overwhelms the senses. Their jaw dropped when I reminded them that they were viewing the area after 3 1/2 weeks of clean-up. A lot has been done, but the clean up task remains monumental. Chain Saw Work: If you remember the old game “pick up sticks” you will get some idea of what the landscape looks like in many areas of Lakeshore; only lots bigger. I couldn’t begin to estimate how many trees were snapped off or uprooted . We have several on the church grounds and countless others on church member’s property. In addition to downed trees, we have a 100X40 foot wooded area of our church property we need clear cut. We will probably place a temporary building here so that we can keep the main portion of our land open for new construction. Portable Saw Mill: If anyone happens to have access to a portable saw mill and the expertise to operate it, we should be able to make lumber out of many of the trees. I do not know anything about this, but it seems to be something worth looking into. Debris Removal: Tree limbs, household appliances, children’s toys, clothing, pieces of furniture, concrete blocks, and all manner of debris litter the landscape like grotesque monster confetti. All of this, large and small, needs to be removed. If you can operate a Bobcat, a tractor, a wheel barrel, or even a garden rake or broom, we could use you. House Demolition: Most of the houses even partially left standing will need to be demolished. For example, you can see what the Fricki’s house looks like. Most of our member’s homes look like that or worse. As soon as the insurance companies give the OK, these houses will have to be torn down and hauled away. 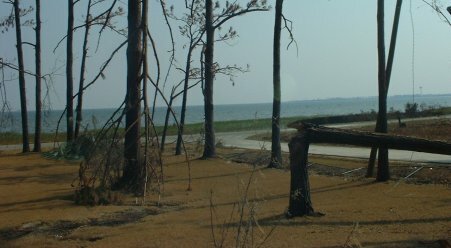 Dirt Fill: Many trees were snapped and broken off at various heights, but many others came up completely by the roots leaving massive holes in the ground. After we haul off these roots systems, we will need to bring in lots of dirt fill. We will also need to build up the marshy areas of our church property to prepare for the new construction. If you would like to schedule a trip down, we could use all the help we can get. Just tell me when you would like to come and what kind of work your group can do and we will point you in the right direction. Please put “clean up,” and perhaps the date you would like to come, in the subject line to help me keep things organized. You can contact me at elbourne@lakeshorebaptist.net. People from here are still missing. Prayers for them are being offered behind a steeple that was recovered from a decimated church. Tuchman interviews a few folks and shows just a small glimpse of the devastation. The camera pans across some of the destruction and then to our blue tarp make-shift shelter and our salvaged steeple. You can watch the video on the CNN web site. My friend, Chris Bostick, finally reported in after the storm. He is OK, but his house is gone. Chris’s grandfather, Ed, and I were good friends. After Ed died Chris and I began building a similar relationship. God has been working in his life in various ways. Chris had requested baptism. We were in the process of discussing the supernatural change God performs in our hearts through regeneration, what it means to be a believer, and the forgiveness of sin Christ provides through his work on the cross. I pray that God will continue to work in his life to His glory. I love Chris and his family. I hope they do not mind me posting a picture of where his grandma’s house used to be. The big front porch looked out over the water. 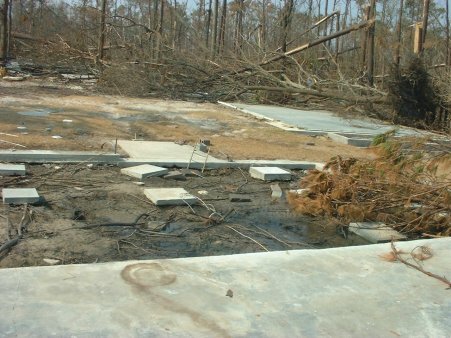 Katrina’s monster storm surge took the entire house. Not even a single board from the structure could be found. I took this picture standing in Mrs. Bobbi’s front yard looking up at the slab for the front porch. Standing on the porch, looking where the house used to be you can see the slab of Ed’s big work shed off to the right. Chris’s house used to be somewhere back there to the left. Sitting on the front porch looking out to the water. Our pianist, JoEll Fricke lost everything in the storm. Pictured above, you can see her house collapsed on top of her car. Her and her husband Geb just finished renovating the house and we had scheduled a church fellowship in their home the day before Katrina hit. We canceled the fellowship to evacuate. When the time comes I hope to have volunteers willing to lend her and Geb a hand in rebuilding their house. For now, JoEll really needs a car. We found the church piano, that JoEll has played for years, in the woods across the road from where the church used to be. My pulpit laid beside it, surrounded by other rubble. We found the top of the piano about a hundred yards away. I could not begin to tell you how much of a blessing JoEll has been to me and Lakeshore Baptist Church over the years. Her leadership in our Vacation Bible School musical highlights every summer. She always has an encouraging word for me. She volunteers for everything. Pictured below she wraps a shoe box for Operation Christmas Child. Her two beautiful children Gabrielle and “little Geb” are such a blessing. She is like a sister to me. I know it may be asking a lot, but I’d really love to provide her a means of transportation. If anyone would like to donate her a vehicle please call her at (228) 493-1317. Update: The Lord provides! A gracious church in the Chicago area donated us a car and we passed it along to JoEll. Now they need a house.